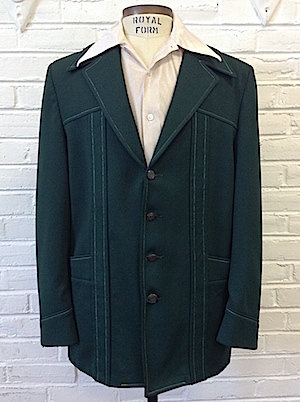 Mens vintage 1970s disco leisure jacket! 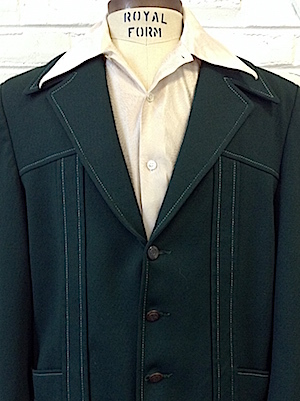 A fine funkalicious leisure jacket in dark green with mint topstitching! 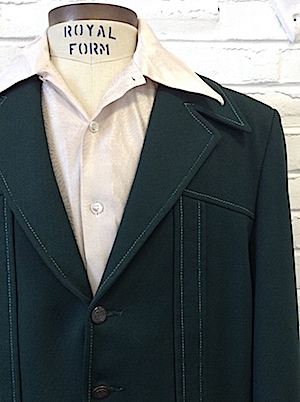 Super wide 70s split lapels, four bronze color buttons w/ royal-esque emblems in the center. Two front pockets on the lower portion of the jacket.Fully lined in a cream acetate. No material tag but feels like 100% polyester. Condition: Very Good. Has a small pull on the right sleeve and one on the left pocket. Does not detract from the awesomeness of this jacket.